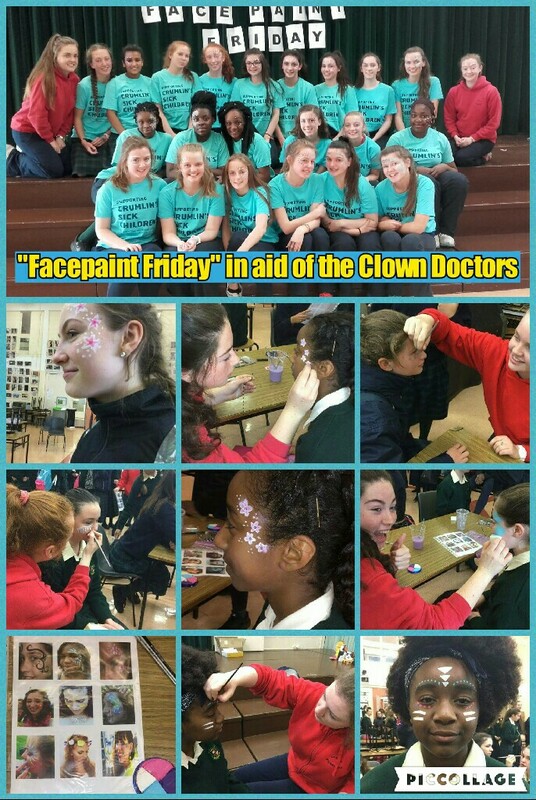 Slowly but surely “Facepaint Friday” posters began to creep up around the school, and all of us in Loreto got more and more excited for our latest out-of-the-ordinary school event. I’m sure we’re all well used to the crazy events that unfold at our school by now, (can we all just take a moment to appreciate ‘Funky Shoe Day’?) but this is one thing that we weren’t expecting. On Friday 14th October, TY members of the Fundraising Committee put on blue T-shirts and set off on a mission to paint students and teachers faces in aid of the Clown Doctors. Who are the Clown Doctors, you ask? Well, the Clown Doctors are an organisation who have been working in Our Lady’s hospital in Crumlin. They’re professional entertainers who have a love for putting a smile on people's faces. They work to make it easier for children and their families to adapt to hospital life, dressed up as clowns. Basically, their main goal is to make sick children laugh and to lighten the mood around the hospital and they do a really good job of it. When Ms.Ryan shared her idea with the Fundraising Committee, we all loved it. What could be better than turning your schoolmates (and teachers) into festival-goers for the day, all while raising money for a great cause? There was a huge rush of excitement as we opened brand new face paints, paintbrushes, sponges and gemstone stickers in the sewing room and got to work on our 2nd Year test dummies, who were kind enough to “volunteer” to let us practice on them (thanks Ms.Ryan!) Once we got our practice runs in, (and our mistakes out of the way) the face painters were ready for the big day. By the end of the day, we managed to raise €650 in aid of The Clown Doctors, and to create a more joyful atmosphere around our school. After all, who could be in a bad mood walking around on a Friday with flowers painted on their face or with multi-coloured dots above their eyebrows? I, for one, certainly couldn't. When we all left school, a smile wasn't the only thing on our faces- we had a great start to our weekends. I think it’s safe to say that we are all hoping ‘Facepaint Friday’ will make a re-appearance next year, with even more glitter and gemstones than before.